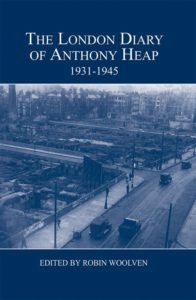 Anthony Heap (1910-1985) kept a daily diary, recording his life in St Pancras, his work, loves and experiences from the age of 17 until shortly before his death. This volume provides selected extracts from the 1930s and the Second World War, an eventful period during which his father committed suicide, Heap joined Mosley’s Fascists, and then stood for the local Conservatives in 1937; the author vividly recounts what it was like to live through the Blitz, sleeping in air-raid shelters, and viewing the nightly raids on London. The diary also recounts more personal details, his fondness for weekly drinking in pubs in Fitzrovia and Hampstead, a series of girlfriends before marrying in 1941, and his love of the theatre: it is predictably opinionated, often infuriating and cutting, but never dull. The extracts are presented here with notes, introduction, and an outline of the principal people involved. Robin Woolven researched wartime London for his PhD, gained from King’s College, London. His primary research interest concerns the twentieth-century history of Camden (Hampstead, Holborn and St Pancras).